An image of what I saw in creative visualization. This large, black blog was suffering, imprisoned in an electric fence. 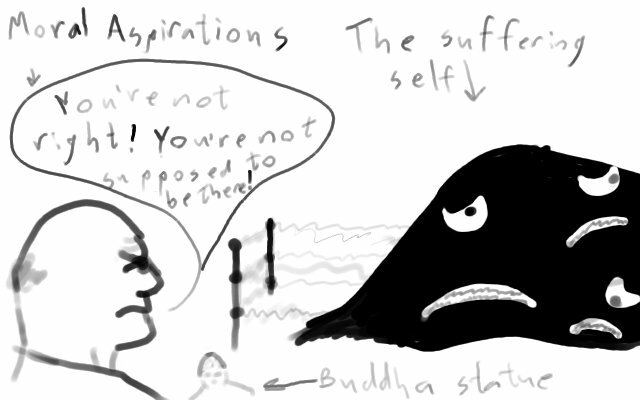 This “moral” guy (aka the ego) had him imprisoned, and had lots of idols on the walls, like a Buddha statue. I freed the blob and shattered all the statues. I don’t know what to say. In fact, I’m not sure I even want to post anything. But I still have something to share today, and I’d be a fool not to. Ok, maybe not a fool. I’d just be me, but I’m going to share it anyway. Sometimes, we get so invested in becoming good by our definition of it that we ignore our own suffering. We struggle and strive for an ideal that we forget ourselves, in all our darkness, moodiness, suffering, desires, insecurities and fears. When we desire something intensely that we don’t have instead of tending what is within us, it can be like putting ourselves in a cage. We want to become not-ourselves. We want to transform ourselves into only that which is good, rather than seeing the beauty in the real, untransformed us.